CEN Studios has been in business for 10 years in Bel Air, Maryland. It is owned by Carole Novak who has been designing for most of her life. Since her teen years, Carole has studied and worked in various design fields. In later years, she designed landscapes and gardens for almost twenty years in the Harford County, Maryland area. For ten years after that, Carole worked for a non-profit organization designing newsletters, websites, and advertising pieces. 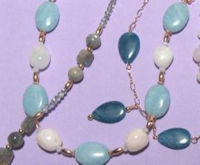 Carole has been designing gemstone bead jewelry since 2006. 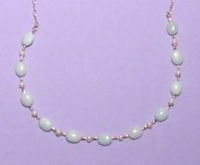 She is always looking for new gemstone beads and new and different methods of designing jewelry with them. Jewelry design allows Carole to use her full range of design abilities to design and craft one-of-a-kind jewelry pieces for you just as she designed one-of-a-kind landscape designs for her landscape clients. Gold-filled jewelry is composed of a solid layer of real gold bonded with heat and pressure to a base metal such as brass or copper. In the U.S. the quality of gold filled is defined by the Federal Trade Commission. If the gold layer uses 14 kt gold, the minimum layer of 14 kt gold in an item stamped “GF” must equal at least 1/20 the weight of the total item. Gold-filled items are up to 100,000 times thicker than regular gold plating and should last a lifetime of wear. After wearing your gold-filled jewelry, wipe it gently with a soft cloth to remove soil and body oils and store it in your jewelry box. For gold-filled earrings, (or any pierced ear earrings) clean the part that goes into the ear with the ear cleaner that can be purchased where ears are pierced. Once dry, place them in your jewelry box. Rose gold jewelry is plated over a copper base with a lacquer finish applied to protect it. To keep your plated rose gold jewelry beautiful follow the instructions above for Rose Gold-filled jewelry. Just remember, though, plated jewelry will not last as long as Gold-filled jewelry. Please note that some plated jewelry is now being dipped in plastic liquid that dries to a smooth finish. It’s especially used on thick chains. The plastic coating will protect the chain for a very long time. I have a few pieces which use this covering and I note its use in the descriptive info where used. The information above applies to Gold Filled as well as to Rose Gold Filled. Match it with copper-toned accessories. Rose Gold contains copper so it will match beautifully with other rose-hued jewelry. Mix it with your favorite white and gold jewelry pieces, whether they're silver, goldtone, or karat gold jewelry. Have fun and enjoy your new Rose Gold jewelry. I'm sure once you start wearing Rose Gold you'll never want to stop. Yes, that's right free mail delivery of your new jewelry to anywhere in the U.S.A. If you are not satisfied with your purchase then notify me and return your item within 14 days of receipt of your purchase. Returning customers receive free earrings from our earring carousel with second and subsequent purchases.